Seagate has introduced a trio of 10TB hard drive models today, as part of the launch of their new Guardian series. There are three main parts to the series: BarraCuda Pro, IronWolf and SkyHawk, all focusing on slightly different markets and available in capacities up to 10TB. The top 10TB models from each segment are based on helium technology, which we have covered in detail in multiple articles. We will be taking a look at the NAS-focused IronWolf series next month, but, a quick look at the performance and features of the BarraCuda Pro is the focus of this capsule review. The Seagate BarraCuda Pro 10TB is a 7200RPM SATAIII (6 Gbps) hard drive based on helium technology with a 256MB DRAM cache. According to Seagate, it typically draws around 6.8W, making it one of the most power efficient 3.5" hard drives in the market. It targets creative professionals with high-performance desktops, home servers and/or direct-attached storage units. It is meant for 24x7 usage (unlike traditional desktop-class hard drives) and carries a workload rating of 300TB/year, backed by a 5-year warranty. The various aspects of the drive are summarized in the table below. The main focus of our evaluation is the performance of the HDD as an internal disk drive in a PC. Towards this, we used one of the SATA 6 Gbps ports off the PCH in the testbed outlined below. 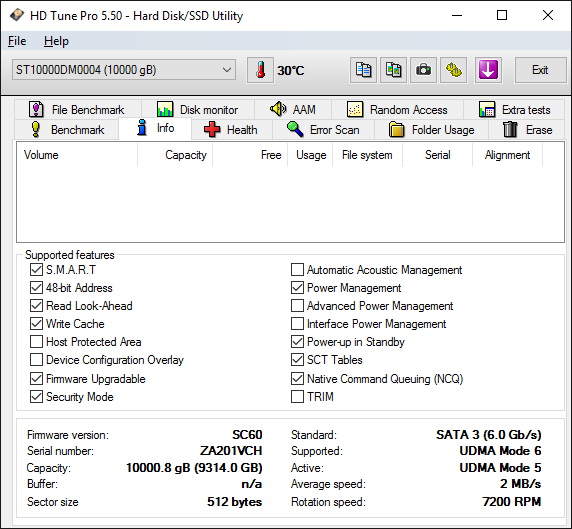 HD Tune Pro 5.50 was used to run a number of tests on the unformatted drive. The gallery below presents some interesting numbers for various access types, and how the location of the data in the platter can affect the performance. Sustained sequential reads can reach a maximum of 258 MBps, but it can also drop down to as low as 110 MBps. Sequential writes exhibit similar numbers. Random reads get around 65 IOPS, while writes come between 56 IOPS and 264 IOPS, depending on the transfer size. The BarraCuda Pro was connected to a 6 Gbps SATA port off the PCH in our DAS testbed. After formatting in NTFS, it was subject to our DAS test suite. Consumers opting for drives such as the 10TB Seagate BarraCuda Pro typically need high-capacity local storage for holding and editing / processing large-sized multimedia files. 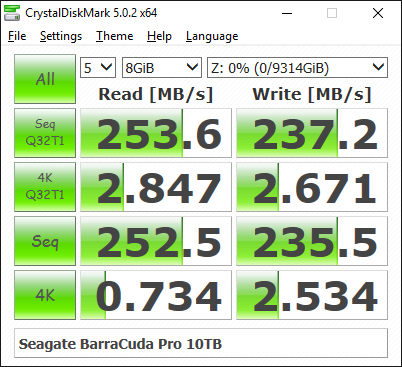 Prior to taking a look at the real-life benchmarks, we first check what CrystalDiskMark has to report for the drive. While processing our DAS suite, we also recorded the instantaneous transfer rates and temperature of the drive. Compared to typical disk drives, the write transfers show higher instantaneous speeds due to a combination of the firmware and the 256 MB cache inside the drive. However, sustained write rates are comparable to other high-capacity drives when the cache is excausted. The temperature of the unit at the end of the transfers (more than 250GB of traffic) was less than 35C, pointing to the power-efficiency of the platform. 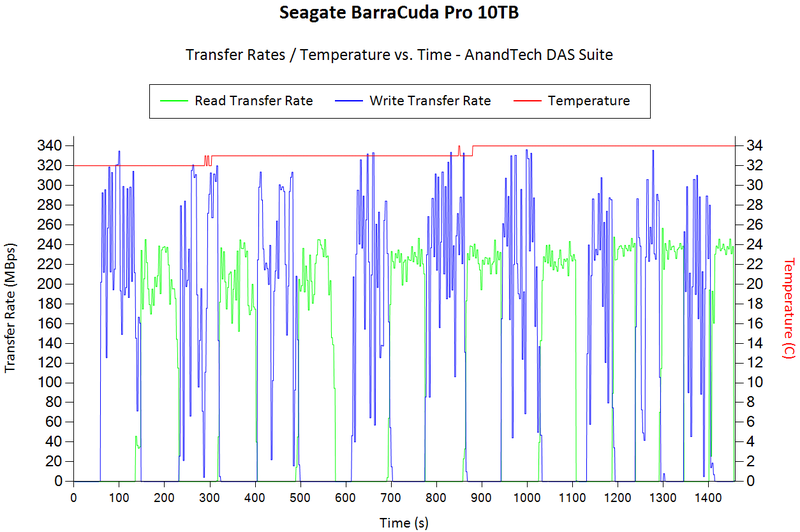 Seagate suggests that the BarraCuda Pro 10TB is suitable for use in direct-attached storage systems. 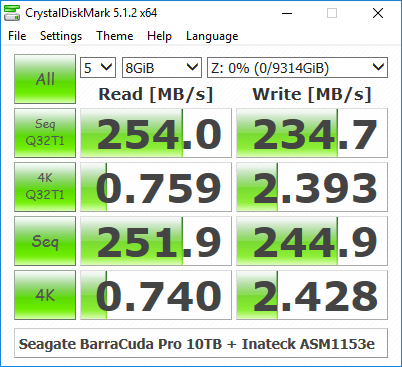 We put the drive behind an Inatek USB 3.0 to SATA adaptor (using the ASMedia ASM1153E chipset) and processed the CrystalDiskMark benchmark. During the benchmark process, we also noted the power consumed by the adaptor at the wall. We found that the combination could draw up to 12W during the spin-up of the hard drive. With no disk traffic, the power consumption dropped down to 3.4W. During the benchmarking process itself, the power consumption at the wall ranged between 6W and 8W. Coming to the business end of the review, it can be clearly seen that the BarraCuda Pro 10TB is a unique product in the market. It is not often that we see a leading capacity 'desktop-class' hard drive rated for 24x7 operation or workload ratings of 300TB/year. To top it all, Seagate is even throwing in a 5-year warranty. The only disappointing aspects are the load/unload cycle rating and the MTBF - given the positioning of the product, it could have been closer to that of the enterprise drives. In our evaluation, the drive successfully met all of Seagate's claims. It is pleasing to see helium make its appearance in mass-market consumer devices. Hopefully, economies of scale should help the current MSRPs to go further down in the future. There is a price to pay for all of the above aspects, though. 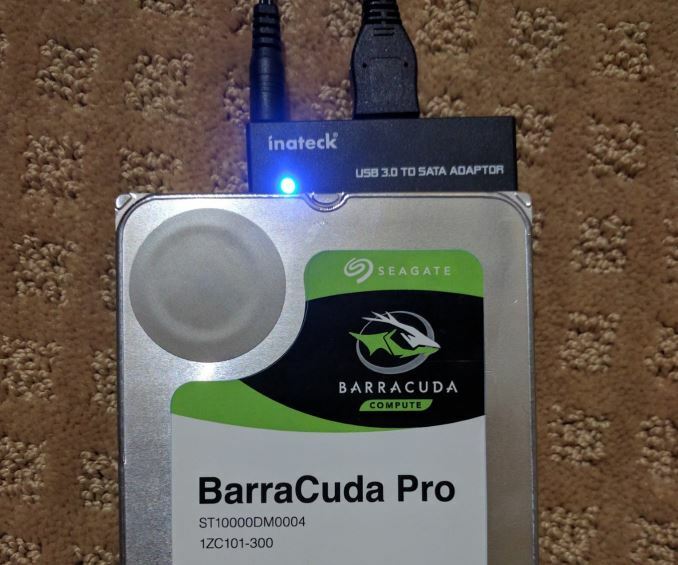 The MSRP of the BarraCuda Pro 10TB is $535, and it is quite a bit more than that of the other 10TB drives being launched by Seagate today - the SkyHawk surveillance drive ($460) and the IronWolf NAS drive ($470). Seagate's Enterprise 10TB Helium drive, by comparison, is currently on Amazon for $600. We will address these drives in due course in order to accurately map Seagate's performance roadmap. The drive may not have an exposed PCB on the bottom so putting it on a carpet might not actually pose a significant problem. Since the matter's come up, I'm sort of curious about the construction of the casing anyway given the fact that its a new helium drive. The construction methods we're accustomed to may no longer apply. I see every review out there insists that these are helium drives but only the Enterprise class drives appear to use this tech.